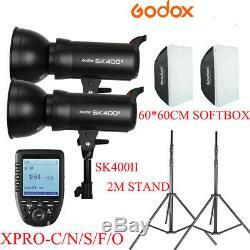 Godox SK400II (2X400W) 800W Studio Flash Light & 2m Stand Softbox Trigger Kit. 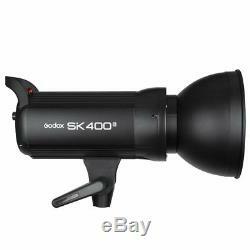 With built-in Godox 2.4G wireless X system, SKII Series is a cost-effective compact flash strobe for e-commerce product shooting, portrait and lifestyle photography. In smalland medium studio shooting, it can work as high light, background light or hair light. 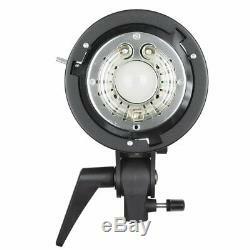 Quickly installs various Bowens mount light accessories such as softbox. Built-in Godox 2.4G wireless X system with outstanding functions. Anti-preflash function enables synchronization with cameras that have a one-preflash firing system. Outstanding output stability, no more than 2% shifts when under the same ouput. Auto memory and recovery of adjusted panel settings. Power output control: OFF, 1.03.0? Modeling lamp level: 9 levels(L1 to L9). Triggering method: Sync cord, test button, slave triggering, wireless control port. Flash duration: 1/2000 to 1/8000s. Package size: 44 27 21.5cm / 17.3 10.6 8.5in. Package weight: 2871g / 6.33LB. 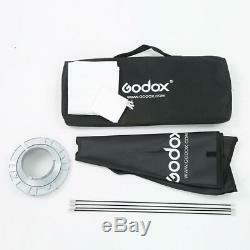 Godox XPro-C/N/S/F/O 2.4G TTL Wireless Flash Trigger. Xpro-C TTL Wireless Flash Trigger can not only control the flashes with built-in Godox wireless X system, e g. Camera flashes, outdoor flashes and studio flashes, but also can control the Cannon original flashes when using in combination with X1R-C receiver. Featuring multi-channel triggering and stable signal transmission, this flash trigger applies to hotshoe-mounted Canon EOS series cameras. Built-in Godox 2.4G Wirless X System & Versatile Using Methods. Can as a Wireless Godox Flash Trigger / Wireless Canon Speedlites Trigger/ Wireless Shutter Release Trigger/ Flash Trigger with 2.5mm Sync Cord Jack. 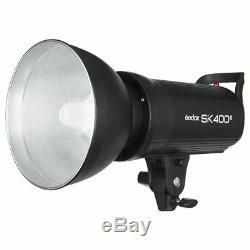 Support E-TTL II Autoflash and Professional Functions. 16 groups and 32 channels to wirelessly control and trigger. Add 01 to 99 wireless ID settings, which can only achieve triggering when the channels and wireless IDs of the master and slave unit are set to the same, avoiding signal interference effectively. 1/8000s high-speed sync, multi flash, manual flash, flash exposure compensation, TCM transform function, magnification function, one-shoot & multi-shcxt setting, group modeling lamp control, group zooming, adjusting all groups1 output value simultaneously, etc. Outstanding Design, Easy Operation and Great Portability. Extra-large LCD panel, 5 group buttons and 4 function buttons offer convenient manipulation. Xpro-C is quite portable for it only weighs 80g. Support Type-C USB firmware upgrade and wireless triggering by 2.5mm sync cord jack. 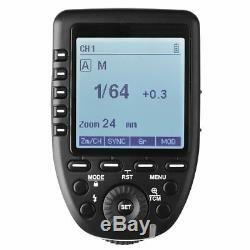 This flash trigger can be used on the following Canon EOS series camera models. 1Dx MarkII 1Dx 5Ds/5Dsr 5DIV 5D MarkIII 5D MarkII. 7D MarkII 7D 6D 80D 70D 60D 50D. 40D 30D 750D/760D 700D 650D 600D 550D. 500D 450D 400D Digital 350D DIGITAL 100D 1200D 1000D. 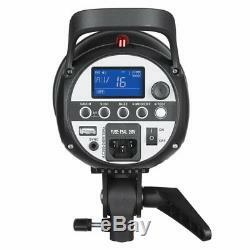 This flash trigger can be used to control the following flashes models. V850ll/TT685 series TT600/TT350C/Quickerll series QTII/SKII series/DP II series/GSII. 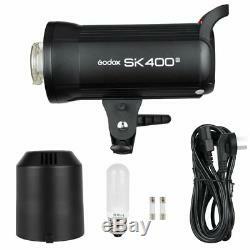 As there are so many camera flashes in the market which are compatible with Canon speedlites. We do not test one by one. The flashes with Godox wireless USB port. Quicker series/SK series/DP series GT/GS series/Smart flash series (only for triggering). 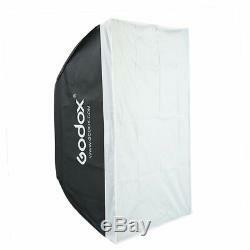 Godox 24"x24" 60x60cm Softbox Bowens Mount. Size : 60x60cm / 24" x 24". 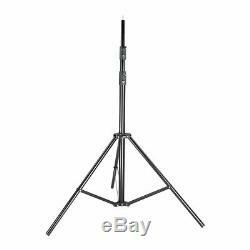 Maximum height is 200cm, fold down to 67cm for easy portability. Professional quality aluminum frame with black satin finish. Simple quick-release levers provide fast precise height adjustment. Extra wide angle footprints with rubber tips for more stability. Folding frame design for freewill lighting position setting and easier storage. 2 2m Light Stand Tripod. We DO NOT accept payments by cheque. SERVICE TRANSIT TIME is provided by the carrier and excludes weekends and holidays. Transit times may vary, particularly during the holiday season. We will inform you if we need more time to prepare the items. As usual, it take 20 to 45 days to reach your designated address by HK Post. If you are not satisfied, please kindly let us know. Your constructive advice will be our motion to revise and improve, thank you for your understanding. We will reply you within 24 hours. 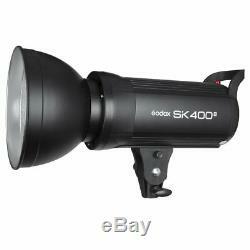 The item "Godox SK400II (2X400W) 800W Studio Flash Light & 2m Stand Softbox Trigger Kit" is in sale since Wednesday, June 27, 2018. 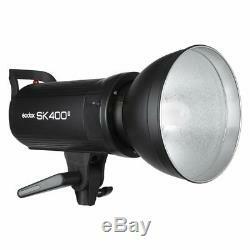 This item is in the category "Cameras & Photo\Flashes & Flash Accessories\Flashes". The seller is "xianghuistoreonline" and is located in ShenZhen. This item can be shipped worldwide.